As well as its miraculous ability to restore fidelity to compressed and process-damaged audio, Unchirp also turns out to be a serious creative tool. Enhances uncompressed audio. Breathes life back into degraded audio. Big choice of restorative presets. Useful creative presets. Simple but powerful interface. 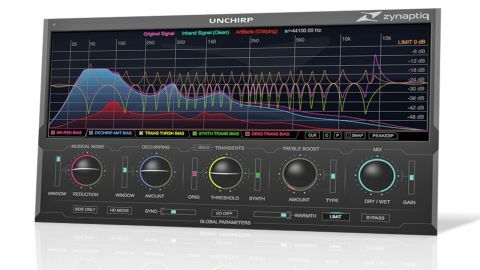 Unchirp (VST/AU/RTAS/AAX) from Znyaptiq is designed to restore fidelity to compressed file formats such as MP3 and AAC, and to minimise artifacts caused by FFT- and frequency domain-based processes like de-noising and timestretching. Beyond all that high-brow stuff, you can also use it to enhance your regular audio files. The Process section contains four processors (and the global Mix control). Musical Noise handles low to mid frequency artifacts, typically found in aggressively de-noised signals, its two controls being Reduction amount and detection Window size (range). "Unchirp comes with numerous restorative presets, making MP3s sound more open and reducing mid-range graininess"
The Transients section synthesises new transients to replace those that have been softened by encoding or processing and allows you to rebalance existing ones using Threshold and its Orig and Synth level controls. Finally, Treble Boost restores lost top end using two crossfade-able processes: Enhance and Excite, delivering program-dependent EQ and synthesised harmonics respectively. Rounding things off are Global Parameters. Side uses a mid/side matrix to process just the side signal, while HD Mode increases the internal processing resolution. Sync is a variable parameter - increasing it gradually synchronises the processing to the transients in the source audio signal. I/O Diff auditions the level-compensated in/out difference signal; Warmth is a random modulation effect designed to ameliorate additional FFT artifacts revealed by the Musical Noise and Unchirping processes. Finally, Limit is a 0dB brickwall output limiter. The contents of the source material have a profound effect on the effectiveness of Unchirp's processes, so it's essential to fine-tune them across the frequency spectrum using the five multipoint Bias Curves in the main display. These enable you to emphasise or rein in each process by setting a frequency-dependent threshold offset. While most of the presets make extensive use of them, we actually got the best results starting with the Bias flat and tweaking it once the general processes had been applied. The main correction tools (Dechirping and Musical Noise) are easy to use, but it's also easy to completely over-process the signal. Keeping the Window size small worked best for us, but the trade-off is that things sound increasingly 'gated' as the processing increases. The Transients control is level-sensitive, so we found it beneficial to reduce the level of fully maximised mixes prior to processing. With that done, it's an enormously powerful feature capable of supersizing deflated transients. Treble Boost works well alongside the Warmth setting, achieving a glossy top end. Unchirp comes with numerous restorative presets, including a whole set designed to reduce artifacts introduced by lower bit-rate LAME MP3 codec presets, making them sound more open and reducing mid-range graininess - Zynaptiq apparently spent a lot of time fine-tuning them by ear. They work best on files whose sample rate has been kept at 44.1kHz (around 128kbps). For all its positives, we do have to mention Unchirp's hefty CPU hit, particularly in HD Mode, where one stereo instance metered a full core of our i5 2.3GHz CPU. That aside, this is yet another fine and unique plugin from Zynaptiq that absolutely delivers on its functional promise.